Bloom: Yes, political stability was at most a factor in assessing developing countries or Russia. It is now also an issue in Western democracies. The Five Star Movement in Italy lets its members vote on its policies online -- with the outcome that the results are often completely unpredictable. And Trump also tends to shoot from the hip. You can see from his sparse Twitter messages that he is constantly changing his mind. Politics has become very unpredictable, making things so very difficult for individuals and also for companies. Bloom: Trump can, like every government, trigger a short boom with borrowed money, just like he has announced. He appears to want to adopt the economic policy approach favored by Republicans of putting lots of money into building roads and cutting taxes. Markets like that. But, at the end of the day, someone always has to foot the bill. Bloom: Exactly, Brexit is a classic example of this. The Brexiteers promised their supporters wonderful things, almost none of which can ever come true. The billions that London transfers to Brussels will most certainly not land in the budget of the country's National Health Service. Brexit is going to be very bitter for many of its supporters. Bloom: The central bank governors were very interested. It sparked a lively debate on questions such as whether political uncertainty impacts economic growth or whether it's actually the other way round, that decreasing growth leads to increased political uncertainty. The prevailing opinion was that there is a correlation in both directions. SPIEGEL: You've already said that growing insecurity is bad news particularly for companies. The Wall Street vet thinks the president will back away from several extreme positions to get things done. President Trump campaigned by promising significant change to the American people. He raised expectations, and that’s why he won. Now he has to get his pro-growth agenda implemented. The key elements are tax cuts for corporations and individuals, dismantling regulation and improving the country’s infrastructure. If he is moderately successful in putting his plan in place, I believe we will see a better economy this year and the financial markets will reflect that improvement. Investors are ambivalent because they are concerned that we won’t see the significant positives until 2018, but I think favorable results will appear before then. The definition of a Surprise is an event that I believe is probable, having a better than 50% chance of taking place, while the average investor would assign only a one out of three likelihood of it happening. Usually I get five or six of the Surprises more or less “right,” but I don’t compile the list to get a good score. The objective is to stretch my thinking and, hopefully, the thinking of others. The first Surprise is that the President backs away from the more extreme positions he put forth during the campaign. He talked about tearing up some trade deals and various other international agreements, like the Iran nuclear weapons deal, as well as some domestic legislation, including the Affordable Care Act, on his first day in office. I believe he will move more deliberately on these policy shifts and that his wastebasket will be empty as he completes his first day of work. I think he will find that some of our trade agreements actually create jobs rather than eliminate them. In certain cases, like NAFTA, these involve many countries, and unilateral withdrawal would complicate diplomatic relations. As for the Affordable Care Act, 20 million people have signed up for insurance, so repeal without a replacement would be very unpopular. Repeal and delay is not a workable option. In any case, his cabinet and many members of Congress oppose an abrupt termination of the existing healthcare program. Trump has assembled a cabinet and set of advisors who are controversial and inexperienced in government. I believe, however, they will work effectively to make sure that radical, disruptive and unsettling changes do not take place. The new president will strive to maintain a high approval rating and he will try to establish confidence among the American people during his first few months in office. As a result he may defer his more divisive agenda items until later in the year. In the second Surprise I said that a combination of pro-growth initiatives would result in a real GDP increase in the United States in excess of 3%. Since the beginning of expansion in 2009, growth in this cycle at less than 2% has been slower than typical post–World War II recoveries. This is consistent with the observations of Ken Rogoff and Carmen Reinhart in their seminal book on 800 years of business cycles This Time is Different. They concluded that when you have an economic recession and a financial collapse at the same time, the recovery is more prolonged than normal. When business is improving, productivity usually rises because companies don’t hire as fast as the new orders come in. In a slowdown the opposite is true: generally managers are reluctant to lay off workers. As a result, I expect to see better productivity numbers as we move through the year. In the third Surprise I believe Standard & Poor’s 500 earnings will be better than expected. For the past several years earnings have been trapped between $115 and $120. This year’s estimates by top-down analysts and strategists are between $120 and $125. As a result of stronger GDP growth, a reduction in the corporate income tax and some regulatory relief, I believe earnings for 2017 will be closer to $130. This would enable the market to move somewhat higher; my target is 2500 on the index, about 10% above present levels. The possible negative in Trump’s economic plan is that the budget deficit would increase as a result of the tax reduction. The Trump economic team employs the analytic tool of “dynamic scoring,” which is based on the concept that if economic growth and earnings for corporations and individuals improve, taxes collected will also rise. I believe the concept is reasonable but I think the increase in government revenues may lag the reduced income from the tax relief. I have another worry about Trump’s economic program. If he slaps punitive tariffs on imported goods and other countries retaliate, that obviously will have a negative effect on business activity. This is one of the extreme positions he talked about during the campaign that I believe he will modify. The fourth Surprise is that the strength in the dollar continues. I have it going to 130 against the yen and 1.10 against the British pound, and the euro dropping below par. The United States is slated to grow faster than any other major industrialized country except China in 2017 and that should attract investors, particularly if there is a perception that investments in other countries will not do as well. The strong dollar is dependent on the Trump pro-growth agenda gaining traction. If important parts of it do not get through Congress or do not stimulate the economy as I expect, the strengthening of the dollar may lose momentum. We are unlikely to have continued growth without a pick-up in inflation. The labor market is already tight. In December, average hourly earnings increased 2.9% year-over-year compared to previous monthly readings of 2.5%. With the unemployment rate below 5%, we cannot expect an increase in growth to take place without an inflation impact. For the fifth Surprise I have the 10-year Treasury yield increasing to something above 3%, perhaps approaching 4%. Clients have questioned how higher rates will affect the equity market. I trotted out my dividend discount model concept from the 1980s and 1990s to gain an insight into that issue. At current yields of around 2.5%, the equilibrium point where stocks and Treasurys are equally attractive, using $130 in earnings, is about 2800 on the S&P 500. If yields rise to 3%, the equilibrium point drops to the present level of about 2250. If the 10-year Treasury goes to 4%, equities would be in trouble, but knowing where the inflection point kicks in is difficult. After Trump’s election the 10-year Treasury yield rose from 1.4% to 2.5% and the S&P 500 rose 10% because bonds were not viewed as competition for stocks at very low interest rate levels. The sixth Surprise reflects my continuing concern that populism is spreading across the Western world. We saw it first with Brexit in the United Kingdom, then with Donald Trump’s election here in the United States. During 2017, with important elections in France, Holland and Germany, we will see how much further it goes. I am worried that Angela Merkel will lose the election in Germany in September. This could be significant because she is the putative leader of Europe and the stability of the European Union could be threatened if she loses her position as Chancellor. There is no clear leader to take her place. Low oil prices and burdensome regulation have held back both production and profitability in the oil industry in the United States. With the price of West Texas Intermediate above $50, I believe we will see more hydraulic fracking and an increase in production here at home. I also expect Iran and Iraq to be stepping up production. The result will be that the price of oil will rise more modestly than the consensus expects. For the seventh Surprise I have it staying below $60 for most of the year. I also anticipate that some members of OPEC will produce more than their reduced target amounts and this will have a dampening effect on the global price of crude oil. In the eighth Surprise, I think Donald Trump will finally recognize he has been wrong about China’s currency. It is overvalued, not undervalued, and the proof is that the country’s foreign currency reserves have been drawn down in defending its value. Last year the renminbi dropped from six to the dollar to almost seven (one of my 2016 Surprises that I got right). This year I expect a further drop to eight to the dollar. China’s economy depends on a trade surplus and a weak currency will help exports. This Surprise is consistent with my general view that the dollar will continue to be strong against most of the world’s currencies. I also think China will be reluctant to draw down its foreign currency reserves much further to defend the renminbi. I am seeing stronger economic data out of Japan and I believe this will continue. Because I believe the yen will weaken to 130 against the dollar, I expect exports to be improving there as well. Japan is a high cost producer in a low labor cost region and that is a weakness, but the quality and innovation of its products coupled with a weak currency should enable it to do well. The country has been in a deflationary recession for most of the past two decades, but I have projected growth this year at 2%, which should result in a strong equity market. This is the ninth Surprise. The price-earnings ratio of Japanese equities is at a discount to the United States and Japan is under-weighted in most institutional portfolios. My tenth Surprise is that we finally have a lasting ceasefire in Syria brokered by the United States and Russia. An agreement will be reached that leaves Bashar al-Assad in power. A step-up in force by Russia and the U.S. will result in neutralizing ISIS in the region. The use of American troops is justified by the recognition that ISIS represents a breeding ground for terrorists whose efforts have been seen in Europe and the U.S., and this expansion must be stopped. The military people in the new administration are strongly in support of this hawkish shift. Every year I always have a few “Also Rans” that do not make the basic list because either they are not as important as the ten I picked or I cannot bring myself to the point where I believe they are probable events. The first Also Ran is that Donald Trump prefers to sleep in a bed in one of his households in New York or Palm Beach rather than the White House. His wife and young son are planning to remain in New York and he will not want to be away from them all week, every week. He will spend time in Washington for important diplomatic and legislative activities but for a good part of April to December he will be in the New York area, and in Palm Beach during the winter months. The twelfth Surprise is ironic. Prior to the election, when Hillary Clinton looked be the winner, pundits were talking and writing about how the Republicans would have to regroup and figure out a way for them to pull away from the extreme positions of Trump’s campaign. Now, with Trump victorious, the Democrats are the ones who are going to have to rethink their strategy. Bernie Sanders and Elizabeth Warren will be attempting to pull the party to the liberal left and Chuck Schumer and others will be trying to keep them near the center. We will see who will hold sway. I believe Donald Trump’s intimidation tactics will be effective in keeping American companies from moving manufacturing overseas, but he will have more difficulty bringing those who have already moved back to this country. This is the thirteenth Surprise. A border tax on imported goods and tax relief for exporters may be helpful here, but I think bringing a large number of manufacturing jobs back will be hard. The U.S. has lost more than five million jobs in the new millennium, but not all of those jobs were lost to foreign workers. Many were lost to robots and will never be done by humans again anywhere. The failure to bring back jobs will be the biggest disappointment of Trump’s first term. In the fourteenth Surprise Trump’s first international confrontation is with North Korea, and it is already happening. Kim Jong-un is threatening to test a ballistic missile in the Pacific, and Trump has said that there is “no way” he will be permitted to do this. The only restraining geopolitical force with any influence on North Korea is China, and getting Kim to back down will be a big challenge to Trump’s negotiating skills. I continue to believe that there is money to be made in the Indian equity market and that is the fifteenth Surprise. The country is growing at 7%. Prime Minister Modi’s reform program is slowly being implemented and very few institutional portfolios own Indian stocks. I think India will be one of the best performers among the emerging markets but I am generally not bullish on the sector. In the sixteenth and final Surprise, Trump attempts to dismantle the Iran agreement to suspend the production of nuclear weapons material, which he believes was one of the worst deals into which the U.S. has ever entered. I think the other participants to this agreement are reasonably satisfied that Iran is adhering to it and will encourage the U.S. to remain a participant. The Trump administration will take some time to determine whether Iran is complying with the agreement’s provisions, so any action is likely to be taken later in the year if at all. So I have tried to provide further detail on the thinking behind The Ten Surprises and the six Also Rans. Now let’s see how the year plays out. Something I already know from talking to clients is that they expect 2017 to be full of surprises with Donald Trump in the White House (or wherever he may be). LONDON – “I don’t care about what it will cost. We took our country back!” This is the proud message heard throughout England since the Brexit referendum last June. And it is a demand that is resonating across the continent. Until recently, any proposal to “save” Europe was regarded sympathetically, albeit with skepticism about its feasibility. Today, the skepticism is about whether Europe is worth saving. The European idea is being driven into retreat by the combined force of a denial, an insurgency, and a fallacy. The EU establishment’s denial that the Union’s economic architecture was never designed to sustain the banking crisis of 2008 has resulted in deflationary forces that delegitimize the European project. The predictable reaction to deflation has been the insurgency of anti-European parties across the continent. And, most worrying of all, the establishment has responded with the fallacy that “federation-lite” can stem the nationalist tide. · An employment guarantee scheme to provide living-wage jobs in the public and non-profit sectors for every European in their home country, available on demand for all who want them. On condition that the scheme does not replace civil-service jobs, carry tenure, or replace existing benefits, it would establish an alternative to choosing between misery and emigration. Only such a European New Deal can stem the EU’s disintegration. Each and every European country must be stabilized and made to prosper. Europe can survive neither as a free-for-all nor as an Austerity Union in which some countries, behind a fig leaf of federalism, are condemned to permanent depression, and debtors are denied democratic rights. To “take back our country,” we need to reclaim common decency and restore common sense across Europe. For the first time in years, inflation is picking up. Inflation measures how quickly prices for everyday goods and services rise. The higher the inflation rate, the quicker prices rise. Most people don’t like inflation. It means they have to spend more money on groceries, gas, and rent. Luckily, we haven’t had much of it recently. The Consumer Price Index (CPI)—the government’s favorite measure of inflation—has averaged just 1.4% since 2009. That’s less than half its historical average of 3.5%. A string of sharp gains since late summer helped drive up inflation by 2.1% for the full year, marking the biggest increase since a 3% gain in 2011. Americans are pay[ing] more for fuel, housing and doctor visits, countering the biggest decline in grocery prices since the tail end of the Great Recession. In 2015, we had an annual inflation rate of just 0.7%. In other words, prices for everyday goods and services are rising three times faster than they were two years ago. The chart below shows forward-looking inflation expectations for the next five years. 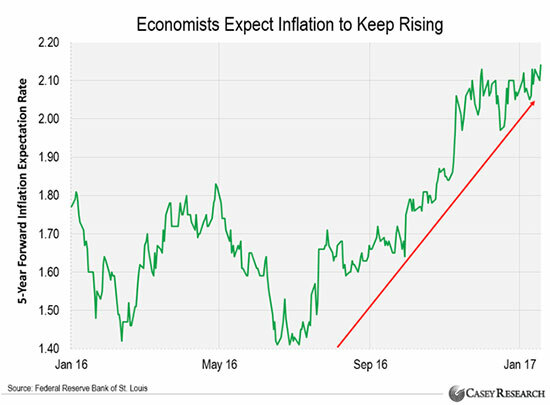 You can see that economists expect inflation to average at 2% between now and 2022. This might not seem like a big deal. After all, inflation topped 14% during the early 1980s. We’re nowhere near that. Deflation is the opposite of inflation. It’s when prices fall. It sounds like the best thing ever. After all, who doesn’t like saving money? But central bankers don’t think about deflation like we do. They see it as a sign of a weak economy. Since 2008, it’s printed more than $3.5 trillion out of thin air. And it’s held its key interest rate near zero for nearly a decade. We’ve said many times before that these reckless policies would eventually generate inflation. We’re finally starting to see that happen. They own too many bonds. That’s because bonds have been in a bull market since the 1980s. 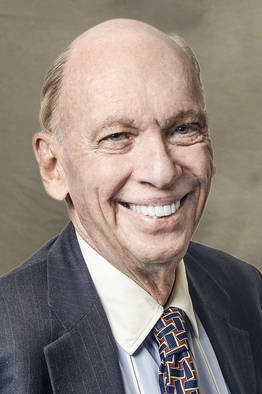 Many people now see bonds as “no-brainer” investments. We also have had almost no inflation the past few years. And bonds are a great investment when there’s little or no inflation. Let’s say you own a bond that yields 2%. If there’s no inflation (0%), your “real” return (a bond’s yield minus inflation) would be 2%. Now, let’s say the inflation rate jumps to 2%. Here your real return would be 0%. You wouldn’t make any money on that bond. If inflation hit 3%, your real return would drop to -1%. You would actually lose money on that bond. In other words, bonds are the last thing you want to own when inflation is high or likely to rise. These days, most bonds yield very little. Take the U.S. 10-year Treasury, which is supposedly one of the “safest” bonds you can own. It currently yields about 2.4%. That’s about half its historical average. Corporate and municipal bonds are also yielding near-record lows. This makes them incredibly vulnerable to inflation. You’ve probably heard that Donald Trump wants to spend $1 trillion on U.S. infrastructure projects. After all, America’s roads, bridges, and powerlines are in desperate need of repair. Plus, Trump’s plan should put thousands of Americans to work. Under President Obama, the U.S. government racked up about $8.5 trillion in debt. The U.S. economy grew just $4.3 trillion over the period. Government debt as a percentage of U.S. annual output (GDP) is now at 105%. That’s the highest level since World War II. To “Make America Great Again,” Trump will have to borrow even more money. And the deeper the government goes into debt, the more inflation we’ll have. Start by looking at your bond portfolio. If you own bonds with rock-bottom rates, get rid of them. Any money you stand to make on these bonds could get eaten alive by inflation. We also encourage you to own hard assets. These are assets with tangible value. They include commodities like gold, oil, and copper. Unlike bonds, hard assets often do well when inflation rises. Think about it. If inflation is rising, it’s going to take more dollars to buy an ounce of gold, barrel of oil, or pound of copper. That’s why everyone should own hard assets when inflation is rising or likely to rise. The Bloomberg Commodity Index (BCOM), which tracks 22 different commodities, is up 18% since last January. The price of copper is up 29% over the same period. Palladium is up 55%. The price of oil has nearly doubled. These commodities could deliver even bigger gains in the coming years if inflation really takes hold. Like other hard assets, gold should do very well if we get more inflation. Unlike other hard assets, gold doesn’t need a healthy economy to do well. It can rise during economic recession, stock market collapse, or even a full-blown currency crisis. You can’t say that about many other assets. There’s never been a better time to buy hard assets. Today’s chart comes from MarketWatch. It compares the price of real assets with financial assets. 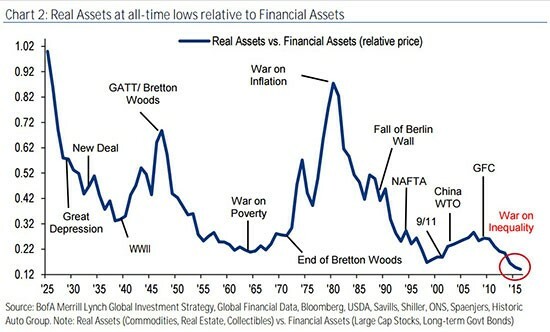 The lower the ratio, the cheaper real assets are relative to financial assets. If this chart looks familiar, it’s because we first featured it in October. We’re sharing it again because it’s one of the most important charts you’ll ever see. Right now, this key ratio is sitting at an all-time low. This means assets like commodities, real estate, and collectibles have never been cheaper compared with stocks and bonds. In other words, we could be looking at one of the best buying opportunities ever. If you don’t already own hard assets, we recommend you get started soon. Once again, start with physical gold. Once you own enough gold for safety, you could consider speculating on other hard assets.